Spring is finally just around the corner. There’s nothing quite like weeks of snowy weather to make the first sights and sounds of spring more beautiful. If you’re anything like me, you’ve been dreaming of getting your fingers dirty in your garden. While the grounds warms up, here are a few simple ways to prepare your garden beds for spring. You can probably have a beautiful, successful garden by just plopping seeds or plants in the ground and tending them as they grow. But having a plan, especially if you have smaller beds like mine, helps use the space most efficiently and beautifully. Plus, proper planning helps ensure good crop rotation. Certain types of soil diseases tend to attack plants in the same family. Planning your garden beds so that you don’t plant members from the same family in the same spot year after year is one of the simplest organic ways to cut down on plant diseases. Of the millions of things I’d like to plant, what are my top choices? How many seeds/plants of each do I have room for/will we actually use? How much space will they take as they grow? Based on where I planted things last year, how should I rotate crops? Finally, as my friend Aneysa encouraged me, how can I make my garden beautiful, not just practical? Seeds, soil, and toolsIf you’ve been pouring over seed catalogs all winter, but haven’t made a purchase yet, now is a good time to order! I personally love Baker Creek Heirloom Seeds or just wandering down the seed aisle at Lowe’s (though it taxes my self-will not to purchase all fifty varieties of spinach.) Having the seeds before the spring planting rush begins helps make sure you don’t miss out on a perfect planting afternoon. Check your garden tools. If your five-year-old just happened to forget to put the spades away and they rusted under a pile of snow, add spades to your shopping list. See that beautiful trellis? It’s a few feet taller than me. By the end of summer, the plants from one side were halfway down the other side! Many cities offer free or cheap wood chips, and some tree service companies are willing to drop off a truckload of wood chips for free. Just call around! Try to avoid black walnut compost though, since black walnut trees inhibit the growth of other plants. Every year I tell myself not overcrowd the garden… and every year I do it again. A gardening expert from church (who has gardens so amazing that they send me into garden paradise) told me you can practically sprinkle spinach seeds on top of snow. Once the snow melts, the spinach will grow. Other early spring crops include kale, lettuce, peas, broccoli, cauliflower, carrots, many herbs, and more. If you plan to grow your own seedlings, they should get started now too. Since I don’t have room in my little garden plots for dozens of tomato plants, I decided to skip growing seedlings this year. While the ground begins to thaw, get your gardens ready by planning your plots, gathering supplies, prepping the soil, and planting spring crops. Our little garden is bursting with spring greens and berries. The tomatoes are finally inching their way up the trellis and tiny flowers grace the peppers. We’ve been enjoying fresh garden salads and bowls of sun-ripened strawberries. We’ve also been battling bugs. Lots of bugs: asparagus beetles, squash bugs (despite not planting squash), rolly pollies, slugs, and aggressive ant colonies, just to name a few. These pesky bugs are an organic gardener’s nemeses. I love knowing that our little garden spot is free of pesticides. It just means I need to find other ways to combat the big problem with organic gardening: bugs. The first step to fighting bad bugs in the garden is to know which bugs are enemies and which ones are friends. All bugs are not bad bugs. Even scary-looking bugs may end up being allies in disguise. Lacewing larva, for example, are fierce-looking allies that eat up to 100 aphids a day! (Full disclosure: links to products in this post are my referral links.) 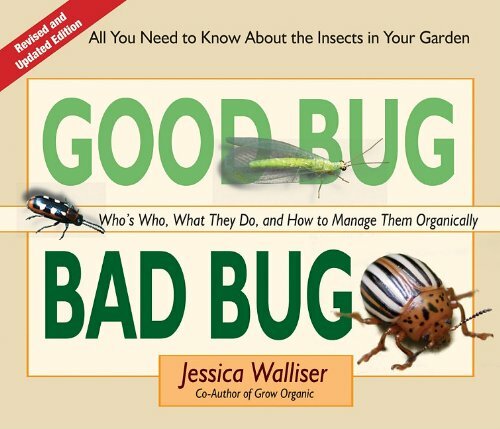 From left to right, the bugs on book cover are: asparagus beetle (bad), lacewing (good), and potato beetle (bad). Good Bug, Bad Bug is my favorite bug field guide. It has beautiful full-color illustrations of the most common garden pests, concise descriptions of what plants they attack, and how to organically fight them. The best part of the book is the section on “heroes in the garden,” which has descriptions of fourteen voracious good bugs organic gardeners should try to attract and encourage in the garden. A plant that is stressed from under (or over) watering makes a prime target for bad bugs. Plants that are struggling from lack of nutrients put up a feeble defense. Not only do vibrant, healthy plants not seem to attract as many bad bugs, they ward off attacks much better. It’s much easier to squash the first bad bugs of a season than to deal with the colony once they’ve multiplied. A bit of vigilance in checking plants for bad bug scouts helps keep serious problems at bay. Sometimes, despite my efforts, bad bugs get a footing anyway. Although bugs make me squeamish, I am trying to imitate Will’s enthusiasm for bugs of all sorts and get over it. Together, we have mounted all-out assaults on squash bugs and asparagus beetles. Much to my surprise, these “battles” ended up being quite fun mother/son activities, even though they involved picking up live bugs and dropping them into warm soapy water. I’m grateful I had my five-year-old to bolster my courage. There are several simple, organic ways to proactively ward off bad bugs: covering vulnerable plants with gauze-like cloth, attracting good bugs with flowering plants, interspersing the garden with companion herbs that help ward off bad bugs, and clearing garden debris in winter. For those of us with chickens, letting them peck through the garden at the end of the season and again in early spring might help cut down on overwintering bad bugs… though the chickens aren’t smart enough to avoid good lacewing or ladybug eggs. Freshly picked lettuce, spinach, and kale. Even though it has a few bug bites, I think it’s beautiful. As a culture, we’ve grown so used to “perfect” pesticide-protected produce that it’s hard to view a leaf of spinach with a bug bite or two as perfect. It’s time to redefine perfect. Flavorful, sun-ripened, pesticide-free produce should make the cut, even if it has a bug bite in it. There’s something so invigorating and refreshing about tending my own little garden space. Not only is playing in the dirt a scientifically proven method for boosting your mood, it is so fun getting to serve my family freshly picked, pesticide-free food. It does mean fighting the organic gardener’s nemisis, but it is worth it. My poison ivy adventure began almost three years ago. The kids and I had just moved into our home. Joshua was still wrapping up his job in Alabama, while I started the unpacking process. With a long day of unpacking ahead of me, I sent the kids outside to explore the fenced-in backyard. Twenty minutes later, Rose and Will interrupted the unpacking to show off the pretty white berries they had found. After admiring the berries’ beauty, I warned the kids not to eat them and went back to work. But this nagging thought kept coming to mind that I ought to investigate their newfound source of berries. The kids gladly led me to the little tree they had discovered behind the shed. Huh, I thought, leaves of three. It almost looks like poison ivy, but I don’t think poison ivy grows in trees. And I’ve never heard of it having white berries. Our internet wasn’t set up yet and my phone had splotchy reception, but it was enough to discover that yes, indeed, poison ivy can grow into small “trees” and it does actually have lovely white berries. Yep. My kids had just had a grand time picking poison ivy berries. I’m paranoid about poison ivy, but tried not to panic. Unpacking stayed on pause while I scrubbed the kids in cold water and wiped down all the surfaces they might have touched with rubbing alcohol. Needless to say, they did not love this experience. Despite my poison ivy paranoia (that is probably due to horrible reactions my mom and brother had to it), I realized just how little I actually knew about this pervasive plant. One of my homeschool goals is to explore and learn about local flora. Becoming poison ivy experts is a very important part of that goal! Deer and bears nibble poison ivy leaves, goats devour them, dogs and cats roll around in them, birds eat the berries, but we humans can’t even touch touch poison ivy safely. Sensitivity varies a lot from person to person. Often, children don’t get a rash after touching poison ivy, but repeated exposure breaks down their resistance to urushiol, the itch-inducing oil in poison ivy. It’s not just the leaves that contain urushiol. The stems and roots do too. Even an old, dead vine can spread the oil. It’s especially dangerous if poison ivy gets mixed in with a burn pile because inhaled oils from the smoke can cause systemic reactions. So, how can you identify this annoying plant? I’m still working on becoming a poison ivy expert, but here’s what I’ve learned so far. Let’s start with the “leaves of three” part. It can grow as a creeping ground plant, wind its way up trees, or grow into a smallish “tree”, but all its forms have leaves of three. These leaves are usually a shiny green in the spring and summer that change to vibrant shades of red in the fall. Sometimes, the emerging leaves are reddish. Sometimes they have a few toothed edges. Sometimes they don’t. See the five leaves? This is not poison ivy. It’s also not poison oak or poison sumac like I used to think. This is Virginia Creeper. Like poison ivy, Virginia creeper has shiny green leaves that turn red in fall. To make it even more confusing, sometimes the early leaves do have groups of three. Even though it’s not poison ivy, Virginia creeper is a good plant to recognize because it very often grows near poison ivy. Both vines might even grow up the same tree! A small percentage of people are also allergic to Virginia creeper. Not only do the leaves contain urushiol, the vines and roots do too. Even dead vines and roots can cause problems because the oil can live on dead plants for years. When the leaves are out, it’s easier to identify poison ivy, but in the winter this helpful ditty points out an easy way to spot climbing poison ivy on trees or fences: the hairy-looking aerial roots. This hairy vine trick didn’t apply to the tree/bush growing in our yard. From what I have read, the hairy vines are only on creeping ivy where the roots aren’t all in the ground. Judging from personal experience, this is a great line to teach your kids. Hopefully the poison ivy you encounter never gets to this stage (because birds love the berries and spread poison ivy far and wide.) But if it does, the greenish white berries are an extra warning sign to stay away! Poison ivy can grow just about anywhere but the desert. It survives brackish water and nearly full shade. It springs up in forests and backyards across America. Though first christened poison ivy by Captain John Smith in 1609, it’s even more common now than it used to be. Want some good news? Poison oak and poison sumac are rare. Like poison ivy, poison oak has leaves of three, but poison sumac has 2-7 smooth leaves that grow on a red stem. After battling the aggressive poison ivy vine behind our shed for almost three years, I was thrilled to learn that poison sumac has never been documented in my state (it’s most common in the Northeast and swampy ares in the Southeast.) Poison oak has never been found in my county. Check your area to see whether these other poisons are a local problem. Poison ivy forms vary slightly from region to region making it tricky to identify. But with the help of the silly little ditty “Leaves of three, let it be– Hairy vine, no friend of mine– Berries white, run in fright,” even children can start becoming poison ivy experts. Learning to recognize and avoid this annoying plant makes time spent in the great outdoors even more enjoyable. Unless you have a ginormous garden or only plant one or two types of vegetables, chances are you have a lot of half-full packages of seeds left at the end of each gardening season. I sure do. Seeds aren’t expensive, but since I like to plant a growing variety of heirloom/organic plants each year, saving seeds prevents waste. It also helps me plant on time since I already have the seeds on hand and avoids the sad situation of having all the variety of green beans I wanted to plant gone by the time I’m ready to shop. Properly stored, seeds can be saved for four or more years. Seeds store best in a cool dry place. This is how I save my seeds. Place the seeds inside a ziploc bag, squeeze all the air out, and then zip it up. Store the bag inside a canning jar and keep it in the lower part of the fridge. It might be a bit extreme, but my seeds have lasted for years. I love starting the gardening season with a good collection of heirloom/non-GMO seeds and adding to them each year. So how can you tell if your saved seeds are still good? Well, you could just plant them and see what happens. That’s what I normally do. Or, you can set up a seed-testing station. For each type of seed, set a piece of paper towel on a plate. Arrange ten seeds on the paper towel. Place another paper towel on top. Moisten the seeds, keep them moist, and see how many sprout. Even fresh seeds rarely have a 100% germination (or sprouting) rate. Normally, at least for me, it’s more in the 75-90% range, depending on the type. Ideally, I’d keep the seeds until they drop down to the 60-75% range, and then toss them… but I’m rarely that scientific about it. Saving leftover seeds only takes a few minutes. Storing them properly keeps them fresh for multiple seasons of gardening and saves time, hassle, and money in the long run. Researchers have recently discovered what gardeners have known for a long time: playing in the dirt makes you happy. Just on a therapeutic level, gardening makes an excellent hobby. Plus you get to spend time in the sun, experience the miracle of life springing from earth, and (hopefully) enjoy organic vine-ripened vegetables all summer long. Hobby gardening is rewarding and just plain fun. Though gardening takes more time, luck, and grit than making a cake, here are three simple keys to help make it successful if you’re a new gardener: good soil, manageable size, and a good location. Before you start your garden, test your soil with a simple home soil test to find out how acidic or alkaline it is. It only costs a few dollars and will save you lots of garden problems. Many plants grow fine in a broad “middle” range, but some are notoriously picky. Blueberries, for example, need very acidic soil to do well. Which is bad news for me. No matter what kind of soil you have, add good quality compost each time you plant to replenish the nutrients. (Starting your own compost pile is simple!) After you’ve planted, mulch to keep the moisture in and weeds out. Just flipping through a seed magazine (or browsing the Prudent Homemaker’s garden site) is enough to get me daydreaming of turning the whole backyard into a lush garden landscape. That would be incredibly foolish at this season in life. Unless you have plenty of experience and hundreds of hours to devote to the garden, start small. If you want to tackle more next season, you can always expand. Not only does starting small keep you from getting in over your head, it also helps you channel your time and money investment on filling the plot you do have with high-quality soil and vigorous plants. It’s way easier to keep up with a garden that is near your back door, than one you have to hike to. The more conveniently your garden is located, the easier it will be to keep it watered and tended. Choose the most convenient spot that still gets enough sun all season long. Most garden problems are due to over or under-watering. By having the garden convenient, you can keep an eye on the health of your plants while going about your normal day and (hopefully) avoid watering woes with consistent watering. In my highly biased opinion, growing a garden is one of the most enjoyable and rewarding of hobbies. Good soil, manageable size, and close proximity will help set it up for success… even if it’s your first time to grow a garden! Experienced gardeners, what else would you add? What’s the most important key to a successful garden? Clear skies, warm sun, rich soil, tiny seeds, and a whole lot of hope: the perfect way to welcome the return of spring. The snow finally melted a couple weeks ago and I have been itching to get my hands in the dirt again. I was going to plant last week, but just as I pulled out the shovels, poor Ned came down with a fever and wanted to be held the rest of that day… and the next. Then it rained. Then we had last-minute company. Then we went out of town for a few days. Then it rained some more. Gardens should be beautiful, not just practical, my friend Aneysa wisely said. Yesterday dawned clear and warm and gorgeous, but I didn’t think there was any way I could get out to the garden since I’d offered to watch my sweet little niece and nephew for the afternoon. Then, almost miraculously, all four little kids took naps at the same time! Nice long naps. While the little ones slept, Rose and Will helped me clean up, dig, and plant in the cozy spring sunshine. Last year, 90% of the planting I did was either in the dark (by flashlight) or just as a rainstorm started. Even though it’s not that hard to pull a few weeds or water my little garden patch with a sweet baby in tow, I find it nearly impossible to actually plant while juggling a baby who would way rather eat dirt than calmly watch me plant seeds. I love gardening so much that it was worth the rain and dark last year. But planting in the middle of a gorgeous day made me almost giddy with happiness and gratitude. Thanks to a layer of mulch that decomposed all winter (and all that rain we’ve had), the soil was rich and moist, so loosening it was a simple job. Last year, the spring garden thrived beyond my wildest expectations. Both beds were full of spinach and kale (and lettuce). It kept growing and growing and growing. We all fell in love with spinach and kale chips and burned through huge bundles. Though it was a tremendously fun blessing, by the time the spring crops died down it was WAY past time to plant tomatoes and cucumbers. Though I am not counting on such amazing success this year, just in case it happens, I’m trying to plan ahead better. While poking holes for spinach seeds, I had a Pinterest-inspired idea. I took two trellises out of winter storage and slanted them to form a “tent” over the spinach. When the weather warms up enough to plant cucumber seeds, I’ll already have their trellis ready. Plus, if the cucumber plants get as unruly as they did last year, they can ramble over the top and form a shade covering for the spinach. Win-win, right? By the time the little ones started to wake up, we’d filled the first bed with lettuce, spinach, kale, and cilantro seeds, with a pretty row of pansies along the front… and Will had gotten distracted hunting for worms. His 2 1/2 year-old-cousin enthusiastically joined in the search. Will marched around the yard in hunt of worms like Christopher Robin on an adventure. Little Elise stumped along behind like Pooh. Cheerful shouts of “I found another worm!” punctuated the rest of our time and little fingers gently settled the “precious treasures” into the garden. Now the spring seeds are all planted and it’s time to water and hope and wait. Happy Spring! The days are shortening and we’re enjoying the last few golden days of fall. As the temperatures begin to drop, it’s time to prepare garden beds for winter. Not only does a little bit of work in fall make spring gardening more pleasant, following these four simple steps will help preserve your garden soil, prevent plant diseases from spreading, and give you the satisfaction of finishing a job well. You’ve tended your garden faithfully all summer and fall. It might be tempting to leave the garden till next spring. Don’t. It will probably take less than an hour to get the garden beds cleared and tidied. The amazing feeling of looking out on clean beds before cuddling up near the fire to plan your spring garden makes every second totally worth it. First, clear away dead annuals. Toss non-diseased plants onto the compost pile [You have one right? If not, fall is the perfect time to start a compost pile!] Throw away diseased plants. Then wipe the dirt from trellises, stakes, and tools. Just to be extra certain not to spread soil-borne diseases, I usually wipe them dry with a bit of rubbing alcohol. Store till next spring. Pruning plants is one of the most daunting parts of gardening. The good news is that even if it’s not quite perfect, a little pruning is almost always better for the plant than none at all. Make a nice clean cut. Jagged edges make it easier for germs to enter. Cut away all diseased branches. Do not throw diseased trimmings in your compost pile because you don’t want to spread the disease to other plants! If you’d like really cut down the chance of disease, daub each cut edge with a bit of Elmer’s glue. It will prevent bugs and germs from entering, but the strong new growth in springtime will grow through it. Garden soil does not like to be left bare. Keep it covered. Your back will thank you next spring. Mulch and cover crops are great options. Cover crop: Cover crops aren’t just for farmers. More and more backyard gardeners are using them to restore nutrients to the soil and provide a green cover during winter. This year I’m planting winter wheat in one of my little beds as an experiment. I’m not planning to actually harvest wheat, but hope that my chickens can get some enjoyment from it. This step is the most fun. Think back over your gardens. What plants did well? What plants didn’t? Did certain plants grow really well together? How will you need to rotate crops to avoid soil disease? Jot down your notes for next years’s garden. You may think you’ll remember that awesome tip for tomatoes till the day you die. If you’re anything like me, chances are pretty high you’ll forget by next spring. Once the garden is tidied, the beds are covered, and the perennials are tended, it’s time to cuddle up by the fire with your favorite gardening book (here’s mine!) and dream about next spring. Summer’s soaring temperatures have plummeted and autumn leaves are beginning to litter the ground. Now is the perfect time to start your compost pile. Not only does a compost pile cut down on your household waste, it turns that “waste” into rich and beautiful soil to grow fresh fruits and vegetables in. Even if you don’t garden, starting a compost pile is worth it. I promise you that the avid gardeners in your life would consider a few loads of fresh compost an awesome present. So why should you start your compost pile NOW? Because a good compost pile needs two types of materials: greens (like kitchen scraps) and browns (like, you guessed it, dried leaves). Plus, if you start in autumn, your pile will be at least partially composted come spring planting time. Pinterest is full of ideas for cute composters. Me? I opted for a plain old-fashioned pile, hidden behind the shed. I’d suggest tucking the pile in a hidden, but easily accessible, spot. If you have to dodge an obstacle course to get to it, the compost pile is likely to get neglected. Also make sure it is a spot that doesn’t stay soggy for days after a downpour. A pile that’s too wet starts to smell bad quickly. To compost properly, the pile should be at least 3′ wide by 3′ long and (eventually) 3′ tall. That size will help it generate enough heat to compost properly. Compost piles are not like puffed pastries. You do not have to measure exactly to get rich crumbly results. The general rule of thumb though is 1 part “green” materials to 3 parts “brown” materials. Left to their own, these materials will compost. Eventually. If you want to speed the process up, keep the pile moist and aerated. Keep the pile moist: If the pile is too dry, it won’t compost well. If it’s too wet it won’t either (and might smell bad). The ideal “wetness” is like a moist sponge. Honestly, when I’m watering the garden in the heat of summer, sometimes I’ll spray the pile down too. I’m not in a huge hurry and don’t worry much about it though. Keep the pile aerated: When you first start the pile, it’s usually nice and aerated. As the materials start to break down, use up oxygen, and compress, the pile gets more matted. If you want to speed up the composting, aerated it a bit with a pitchfork. Again, this is optional and something I only do rarely, because I have plenty of other things I’d rather do with my time! How can you tell when it’s ready? When your compost smells earthy and looks like rich soil not a pile of leaves, eggshells, and potato peels. Sometimes the bottom layer will be ready first and you can just scoop some out to add to your garden soil. Starting a compost pile is about as difficult as doing a load of laundry and NOW is the best time to begin. Just pick your site, add your materials, and wait the pile to turn into rich compost. Want to start your own garden but don’t know where to begin? Of the stacks of gardening books I’ve read, One Magic Square is hands down my favorite. It’s down-to-earth, informative, upbeat, and inspiring. Someday, I want to be a master gardener. I’m not exactly sure what defines a master gardener, but I think it means you’ve spend decades playing in the dirt and tending plants as they spring up, grow, and die. For now, I’m quite happy to play in my little patches of dirt and smile with delight when the children come running inside with crisp warm cucumbers for lunch or devour serving after serving of fresh kale chips. A view from my kitchen window: cucumbers, beans, kale, garlic, pansies, leeks, tomatoes, peppers, more kale, marigolds, and basil. This year has not been a good one for my tomatoes, but the kale? Oh my! We’ve enjoyed dozens of panfuls of kale chips, cream of kale soup, kale in breakfast smoothies, and I’ve frozen a good bit too. When I mourned the loss of two of the raspberry canes I planted, I had no idea that the one remaining cane would be so prolific I have to weed-whack around the bed regularly to keep the yard from being overrun! Gardening is practice in patience. After wanting to plant strawberries for years, it was hard to pluck the beautiful white blossoms off this spring so that they could be strong for next year. But we did. Asparagus is even harder. You aren’t supposed to pick any asparagus the first year (and hardly any the second) so that the roots have time to develop. Some of the spears are plump and look so delicious. So far we’ve been good…. master gardeners say the patience pays off in years and years of fruitful harvests. Hidden behind the asparagus are little patches of parsley. Parsley is supposed to repel the asparagus beetle. Since our garden seems to have attracted most of the bad (and good) bugs known to man gardeners, I won’t hold my breath.